Tudor treat makes a great Halloween dessert! When we hear “marmalade” today we think of preserves made from oranges; but, in the time of the Tudors it had a different meaning. Marmalade was a sweet paste made from quinces, which in Portuguese are called marmellos. 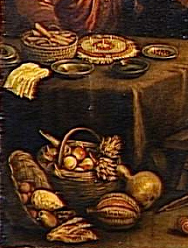 Marmalades were sold in round cakes like cheese. The paste traveled better than ripe fruit since it was more compact, and the sugar acted as a preservative, thereby reducing spoilage during transport. Even today it is much easier to find quince paste than quinces (and less expensive, too). 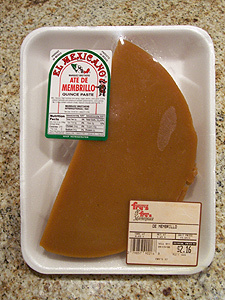 The most common form is dulce de membrillo or ata de membrillo, (pronounced mem*BRREE*yo) which can be found in the delicatessen section of supermarkets that cater to Mexican and Latin American shoppers. It is sold by the pound and the price is a fraction of the cost of making it from scratch! Quinces, a member of the pome family of fruits, are only available between September and January, and the height of the season is in October. Unless you live near a Latin American market you may not find them for sale. Less than 200 acres of quince trees are grown commercially in North America due to their high susceptibility to fire blight. According to USDA, several diseases killed most of the quince trees in North American in the the early 20th century. Horticulturists are now trying to find more resistant varieties in Central Asia that will grow in the USA. 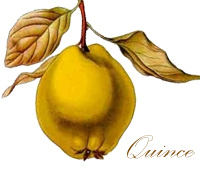 Argentina grows the most quince trees in the world and is the largest exporter of quince products. King Eduard I planted the first quince trees in England in 1275. By the 16th century every orchard in England had at least one quince tree by law. Most varieties of quince fruits are inedible raw and must be boiled to bring out their sweetness. Quinces are high in pectin, the natural substance that makes jelly gel, so they set up very thick. Quince paste was thickened even more in a drying cabinet (food dehydrator) until it was like fruit leather. 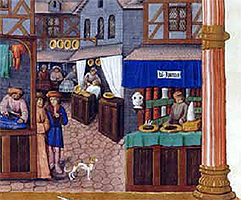 Medieval confectioners used drying cabinets to make various kinds of sweets, including marmalades decorated with designs pressed into the surface. Quince paste was made by boiling cored quinces with sugar and water until the confection could be mashed to a paste and strained. The quince paste changed color from pale yellow, like applesauce, to orange to deep red-orange the longer it was cooked. That made it possible to create a variety of shades for decorative desserts. 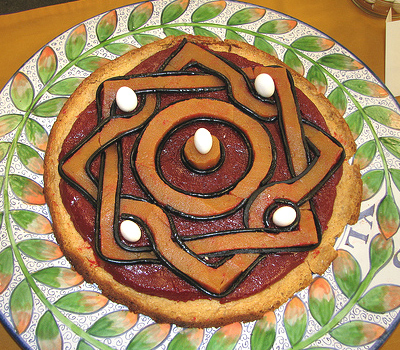 and decorated with licorice rope on toast. Royal confectioners made large centerpieces—2 feet square or larger—for dessert banquets that looked like knot gardens, complete with molded sugar statuary and sugar paste garden temples and walls. The confectioners cut colored slices of marmalade into various shapes that fit together like puzzle pieces for the pathways and herb beds. Then they decorated the gardens with comfits—sugar coated nuts similar to Jordan almonds—for fountains and topiary trees. Marmalade was considered an aid to digestion and was served with the cheese course or, in later times, with the dessert course at the end of the meal. In Argentina and Mexico, quince paste is still served for breakfast with fresh cheese and toast. This is my favorite way to eat it. It tastes like fruit leather or dried figs to me, but other people describe the flavor as a cross between pears and dried apricots. Kids love cutting it into shapes with cookie cutters and eating it, too. 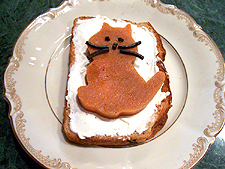 For Halloween you can cut out jack o' lanterns and cats. You can add red food coloring and make hearts for Valentine's Day or Santa Claus hats decorated with cream cheese for Christmas. counter next to a cone of sugar. Sugar from sugar cane was first cultivated in Persia. In the Middle Ages it was imported into Europe from Egypt, but was reserved for medicinal purposes only due to its high cost. It was used to make other medicines more palatable and was considered better than honey for nourishing very ill patients. When cooks needed a sweetener, they usually chose honey. Sugar was so expensive that it was kept under lock and key like the other precious spices and medicines. Raw sugar was sold in cone shapes that had to be refined and ground or dissolved before using. Raw sugar tasted like brown sugar. Sugar merchants refined the raw sugar by dissolving it in heated water to make a syrup, and poured it into a vessel where they had supspended threads or thin sticks. The vessel was then left it in a warm dark place undisturbed for a couple weeks until sugar crystals grew on the threads and sticks. The crystalized sugar was sold as rock candy or ground in a mortar and sifted to make white sugar. Sugar as we know it became plentiful after the colonization of the West Indies in the 16th century. Quinces were also found growing wild in the West Indies as documented by Sir Francis Drake in A Natural History of the Indies. Marmalade garden on a pastry crust. Print out three copies of pattern 1 or pattern 2 knot garden. Tape one to a platter large enough to hold the pattern. Place wax paper or baking parchment over the pattern on the platter and on your cutting board to keep your work surface from getting too sticky. Line a round cake pan with plastic wrap and set aside for later. Cut slices of quince paste 1/2" thick with a wet knife. Take the second copy of the knot garden and cut out the tan pieces with scissors. Place these little pattern pieces on the quince paste slices and cut around them with a small sharp knife to make sections of the knotwork garden. Clean your knife often. Assemble the pieces of marmalade on top of the wax paper using the pattern underneath as a guide. Ata de Membrillo from the deli. Dice all the leftover pieces small. Place the diced cuttings in a small saucepan with a little water and heat on the stove over medium heat, stirring occassionally, until it begins melts. Then turn heat down to low and simmer, stirring constantly, until it begins to caramelize and turn a darker color. Remove from heat and add a few drops of red food coloring. Pour into the lined cake pan and put in the refrigerator for 30 minutes. 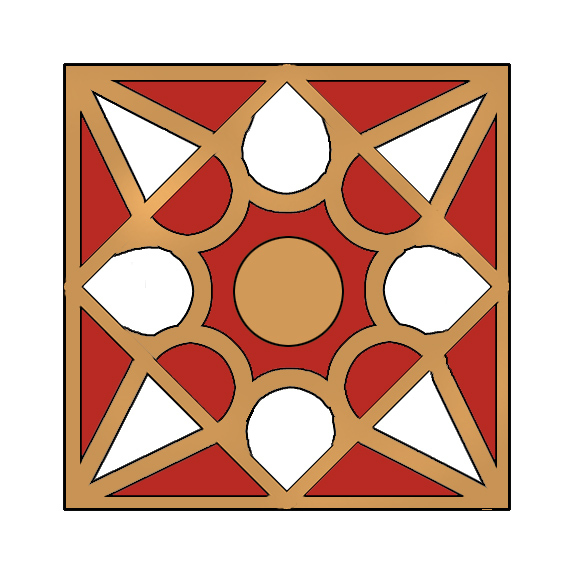 Take the third copy of the knot garden and cut out the red pattern pieces with scissors. Lay them on the quince paste and cut them out in the same manner as before. Finish assembling the design by easing the red marmalade pieces into place with the edge of a knife. 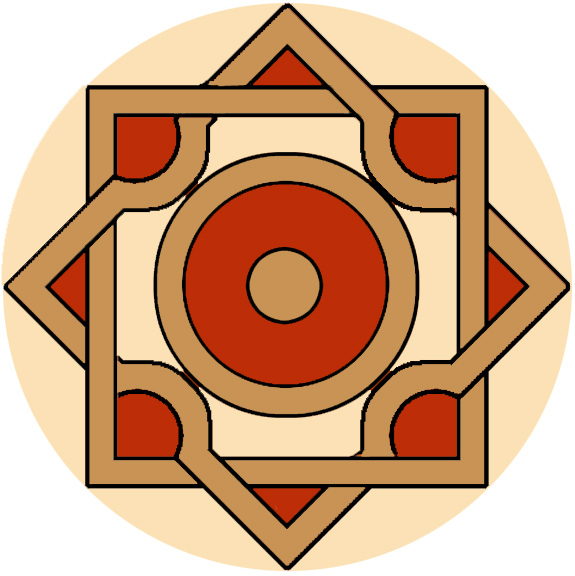 Outline the knotwork with pieces of licorice rope if you want. Stud with Jordan Almonds in the four corners and the center. Serve with fresh cheese and wheat crackers. A Book of Cookrye, by A. W., London, 1591. 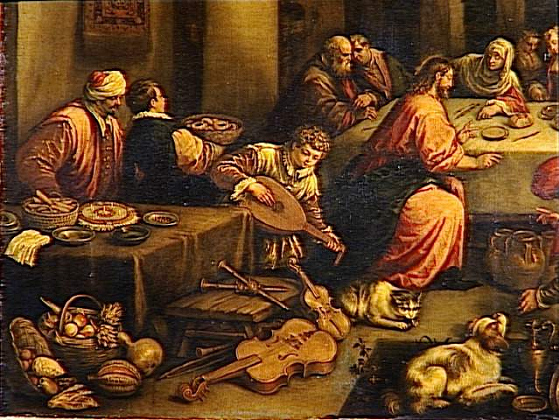 Originally published 1584. Quest for Quinces: Expanding the NGCR Collection, Joseph D Postman. If you want to add this article to your list of favorites or email it to a friend, please use this permanent URL, https://stores.renstore.com/-strse-template/0810A/Page.bok. Permission is granted by the author to quote from this page or use it in handouts as long as you include a link back to Renstore.com.